If you have ever stood in front of the Zion Lodge and looked at all of the surrounding peaks, you have probably noticed the tall and imposing Lady Mountain across the way, guarding the Emerald Pools pantheon. While hiking to the summit may seem like a deranged idea to casual tourists, Lady Mountain was actually an officially maintained trail since the early days of the park, but it was closed in the 1960s as it was deemed too dangerous. For those with good scrambling, climbing, and route-finding skills, following the remnants of the old route to the summit makes for an exhilarating adventure. 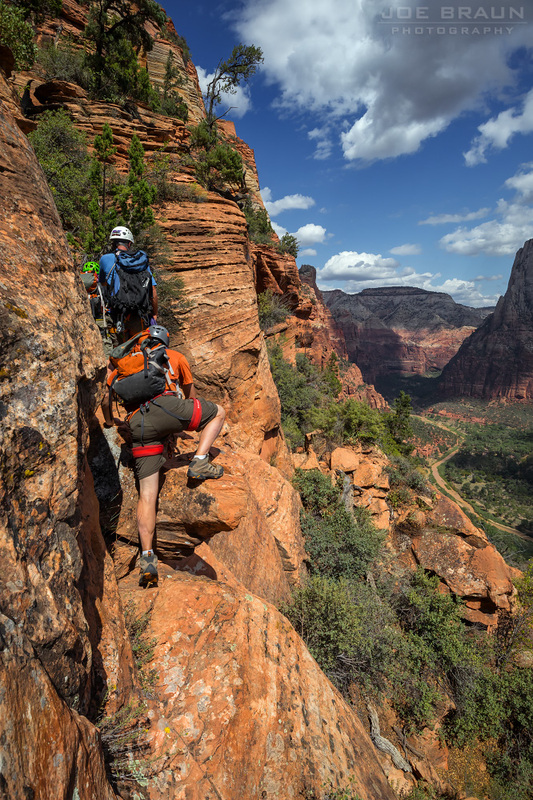 WARNING: This is a strenuous and exposed scrambling route in some very vertical territory. 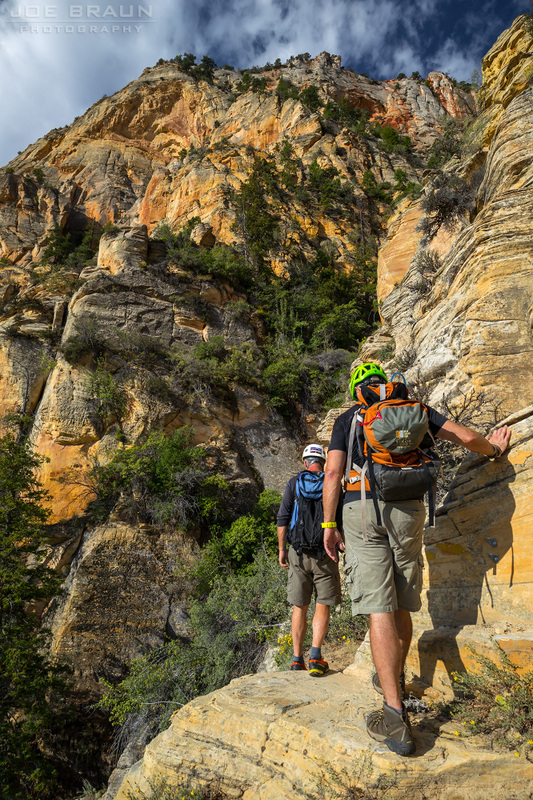 Climbing experience and equipment are recommended; navigation and route-finding skills are also essential. A fall along this route could be fatal. This route is not recommended for casual hikers. 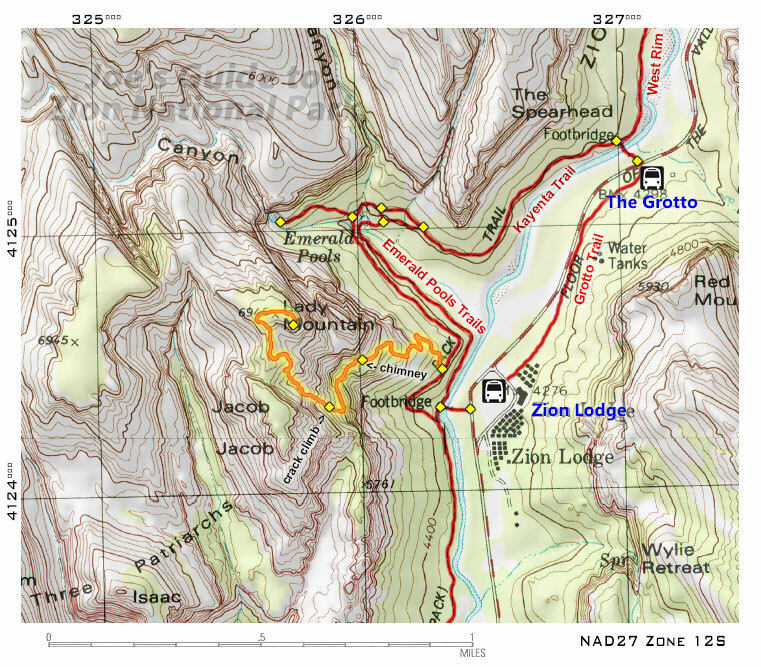 Elevation Change: 2700-ft ascent from the canyon floor to the summit of Lady Mountain. Technical Challenges: Non-stop exposed rock scrambling, navigation and route-finding in remote vertical territory, two short exposed climbs rated 5.6-5.7. Equipment Needed: 100' climbing rope, harness, helmet, webbing and caribiners for anchors or handlines. Seasons: Spring through fall, although summer can be very hot. Weather Warning: Do not do this route if there is a threat of a rainstorm. IMPORTANT: The description below is intended to help you identify major landmarks and stages of the route, but ultimately it is up to you to find and stay on the route. While there are many signs of the old Lady Mountain Trail (painted arrows, painted lines, old bolts, chiseled steps, etc. ), it is quite easy to get off-route and disoriented if you are not constantly paying attention. Stay alert and allow plenty of extra time to find your way. Now it's time to get to work. Climb/scramble up the fractures in the initial cliffband. (If this section of climbing looks like it's too much for you, turn around now before you get hurt or stranded.) You may see random little yellow and red paint markings that confirm you are on route.) At the top of the cliffband, the route heads right and then up the first notable obstacle: the moki steps, a steep and exposed right-facing ramp with carved-out steps to make travel a bit easier. Above the moki steps, continue hiking and scrambling as the old trail zigzags its way west up the many rock formations along the cliffs. (Keep an eye out for the many painted markers and cairns.) Along the way, another obstacle of note is the second set of moki steps that go up a slide; this spot can be intimidating and the start is a bit tall and awkward. 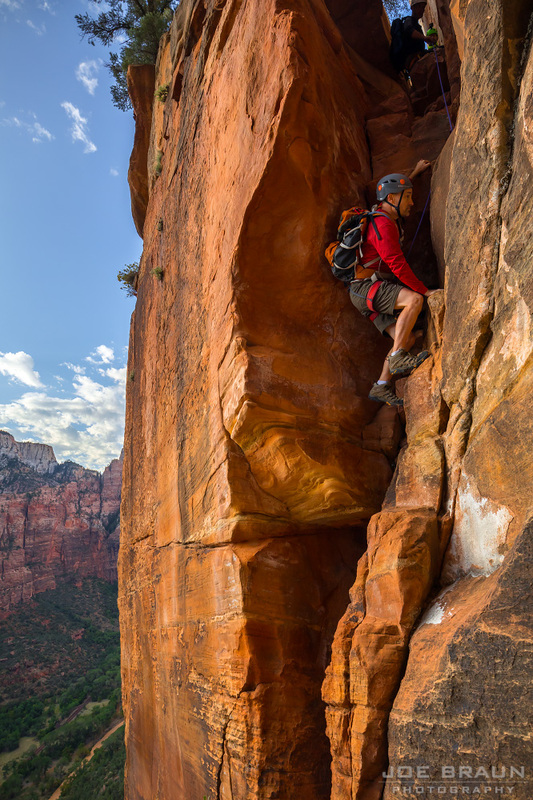 After the chimney, scramble up a few more exposed ledges, then the route levels out a bit and heads due south cross-country to reach the next notable obstacle at the base of the cliffband: the corner crack climb (dihedral climb). While not as exposed as the chimney climb, this shorter climb is a bit trickier, but you can wedge your foot and/or hand in the crack for more leverage. A modern bolt has been placed at the top of this climb to aid in belaying if needed. Once above, you can stash your climbing gear if you want to save weight since they won't be needed for the rest of the hike. Above the dihedral climb, zigzag up the sandy slopes to the stretch known affectionately as the "endless staircase," a long uphill ramp/staircase with a wall on your left side. This section will burn your legs as you make your way up the continually wider and taller sandstone shelves. After about 20 minutes of this uphill slog, keep an eye out for a long painted red line leading up a fault in the left wall; this is where the route leave this ramp. A large ponderosa in the crack also marks this spot. Follow the fault/ledge left to head around to the next section: the upper chutes. Once in the large chute, scramble up past the random boulder obstacles and within a few minutes, the old trail heads up an exposed ledge on the left side for a bit. Further up in the chute, things get pretty strenuous as you navigate past many random obstacles; take care as there is a lot of sand and loose rock from here to the top. Eventually the route turns right out of the chute passing a memorable shaded alcove between two big boulders. Route-finding in the final upper section is imperative as the old trail continues up the next chute to the right, then zigzags its way back and forth between the chute and various ridges to make its way up. Short stretches of sandy trail are mixed in with climbing on solid rock. A few cairns and painted formations mark the way and you will eventually top out on the summit ridge. Yeah! (Be sure to make a note of where the top-out point is.) 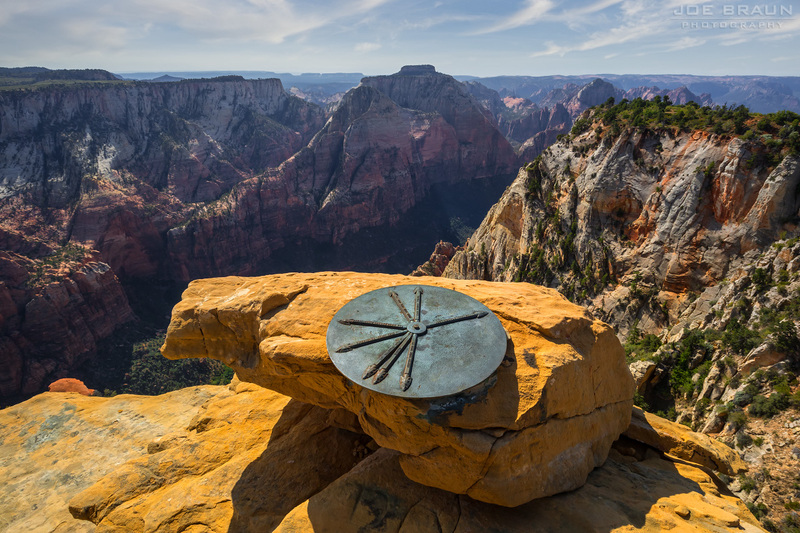 Now it's a simple task of hiking the ridge and circling around to the official summit viewpoint of Lady Mountain, accented by the historic old "sundial" marker that points at many of the surrounding peaks. The view from the summit is outstanding and is one of the best in the park. For the return hike, it would be easy to just say "retrace your steps", but here are a few notes/tips: 1) When you are navigating back down the upper chutes, it is very easy to just blindly continue down a chute and miss a spot where the trail exits left or right. Always be on the lookout; cairns and/or painted markers typically point the way. 2) Just beyond the dihedral corner crack climb in the grassy section, it's easy to accidentally mistake one of the small sandy washes for the trail. 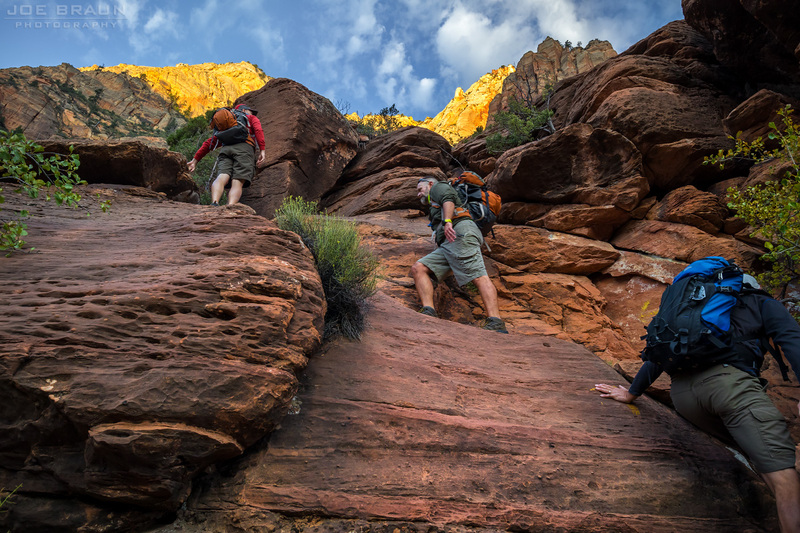 If you get shelved, back up and look for where the trail crosses over the wash. 3) Both climbing obstacles can be easily rappelled back down. 4) Descending both sets of moki steps can be quite intimidating, but if you face backwards, just like how you would come down a ladder, it may be much easier. PERSONAL NOTE: My father remembers doing this hike back in the 1960s before it was closed. The chimney had an iron ladder attached to it. If you have any or know of any old photographs that show any of the aides that used to be in place back when this was an official trail, please contact me! I would love to see them! This is a thrilling, thrilling route with interesting obstacles and wonderful views. And it really makes you ponder how tourists in the 1920s would have handled hiking such an extreme "trail" back in the day. Obviously, this route is not for everyone; there are plenty of other viewpoints and easier hikes for casual tourists. Be safe!